[Table of Contents]These articles are scanned and OCRed from old editions of the Radio & Television News magazine. 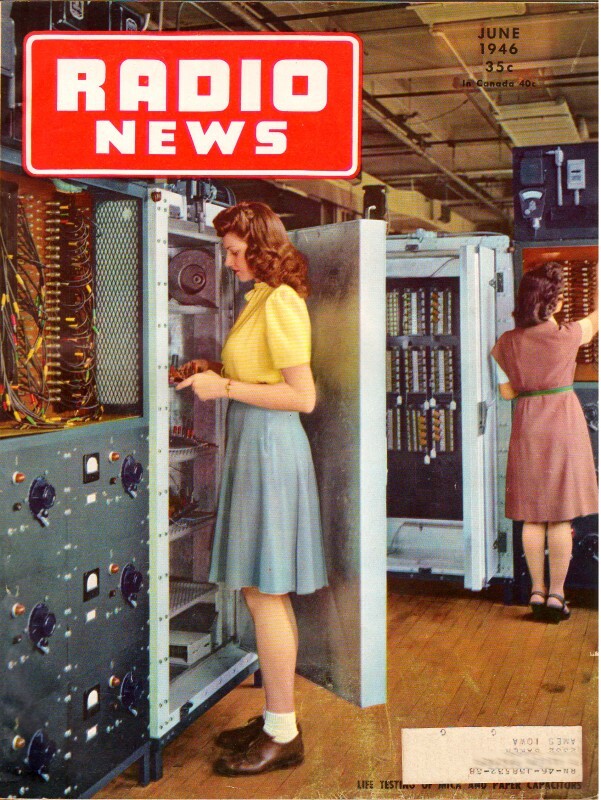 Here is a list of the Radio & Television News articles I have already posted. All copyrights are hereby acknowledged. See all articles from Radio & Television News. Arthur Collins founded the Collins Radio Company in 1933 to enter the fledgling domestic AM broadcast market. His equipment instantly became renowned for high quality and reliability. Collins gained early notoriety as the result of being selected by Admiral Richard Byrd for his South Pole expedition. The U.S. military took notice and the company quickly earned a reputation as a preferred supplier of aviation communications equipment both for commercial and military aviation. As seen in this 1946 advertisement in Radio News, Trans World Airlines proudly employed Collins radio equipment in its fleet of Lockheed Constellation (aka 'Connie') aircraft. Rockwell Corporation bought Collins Radio in 1973, thereby forming the familiar Rockwell-Collins company. Vintage Collins radio sets are very popular with collectors and many dedicated websites have cropped up to promote the designs; e.g., Collins Collector Association and Collins Radio Association. Websites like eBay are the easiest place to find vintage Collins equipment and parts, but events like Hamfests are probably even better if you don't mind driving and walking the venues. As fast as they are being delivered by the manufacturer, TWA's giant Constellations are writing a brilliant new performance chapter in the history of commercial aviation. With an easy cruising speed of 300 miles per hour they are flying 51 passengers across the nation in 10 hours. With a non-stop range of more than 5,000 miles they are speeding 41 passengers from New York to Europe in less than fourteen hours. In point of time, TWA has suddenly reduced the earth's surface approximately fifty per cent in the last few months! 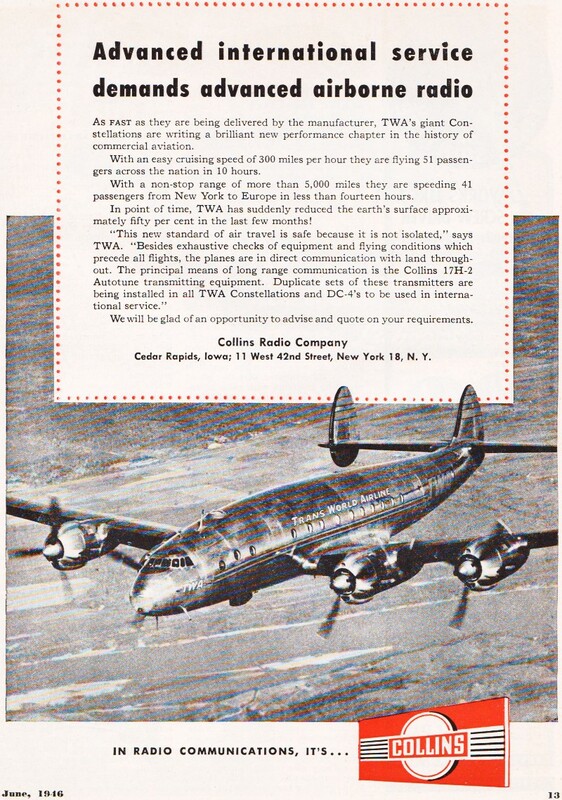 "This new standard of air travel is safe because it is not isolated," says TWA. "Besides exhaustive checks of equipment and flying conditions which precede all flights, the planes are in direct communication with land throughout. The principal means of long range communication is the CoIlins 17H-2 Autotune transmitting equipment. Duplicate sets of these transmitters are being installed in all TWA Constellations and DC-4's to be used in international service." We will be glad of an opportunity to advise and quote on your requirements. Cedar Rapids, Iowa; 11 West 42nd Street, New York 18, N. Y.